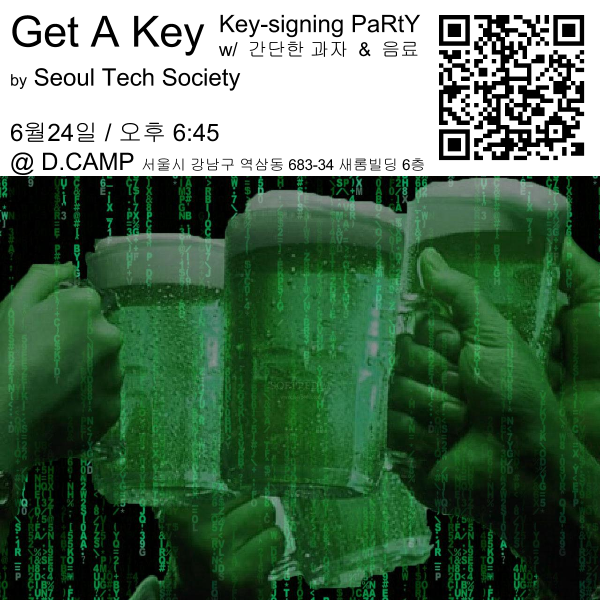 Seoul Tech Society is having an introduction to Public Key Infrastructure (PKI) Wednesday, June 24th at D.CAMP in Seoul. We will give an introduction to PKI, followed by a tutorial for generating your own keys with GPG. We will cover electronically signing documents and software distributions, verifying signatures, basic encryption and authentication using your keys. After, we will talk about - and play with - paranoid.email, which allows you to force partial encrypted email transmission, even when others are not using PKI. Once all that has been covered, and everyone has their own GPG keys, we will have a GPG Key-signing PaRtY!~ Help improve the Web of Trust and have free drinks and light snacks at the same time! If you are thinking about running a key-signing party, please check out this guide.